Familiar & common because of its refusal to stray from the bare bones of story structure. At first glance, Illumination’s Sing! may appear light and frothy, and perhaps lacking a solid story structure. Who is the Main Character? Why do I not care all that much about Buster Moon? And why does it feel so familiar and, as one reviewer put it, completely unoriginal? While the film bears a striking resemblance to My Fair Lady in terms of pure thematic exploration, the real reason many cry average or “seen it” is the straightforward StoryWeaving that leaves nothing to surprise, neither spatially nor temporally. The narrative sets up potentials, doles out resistance to those potentials, plays out their conflict, then delivers the outcome. Nothing is left to interpretation or chance. Add to this an unambiguous encoding of the key thematic elements and you simply cover story structure with a thin translucent film. The bones take precedence over shape and form. Make no doubt, the narrative works. But no one goes to the movies to watch effective story structure. That said, a film with see-through skin makes the perfect subject matter for an analysis of effective and complete story structure. The Overall Story Throughline, while on the surface about competing in a singing competition, actually finds conflict in the gentle Manipulations of the cast trying to be something they are not. Buster (Matthew McConaughey) lies about the prize money in an effort to be someone his dad could be proud of, Johnny (Taran Egerton) pretends to be into the family business, Ash (Scarlett Johansson) the teen porcupine pretends to be OK with playing pop music, Eddie (John C. Reilly) appears to be a record mogul, Meena (Tori Kelly) tries to muster up the courage to pretend to herself that she can sing, Mike the mouse (Seth McFarlane) pretends to be famous so he can get the girl, and finally Rosita the pig (Reese Witherspoon) pretends to be the dutiful housepig as she pursues her dreams. Playing a Role features prominently in this story and pinpoints the source of conflict for all the characters in the story. Their relationships with one another straining under the weight of psychological dysfunction. Ensembles work when all the characters focus on the same thematic issues. 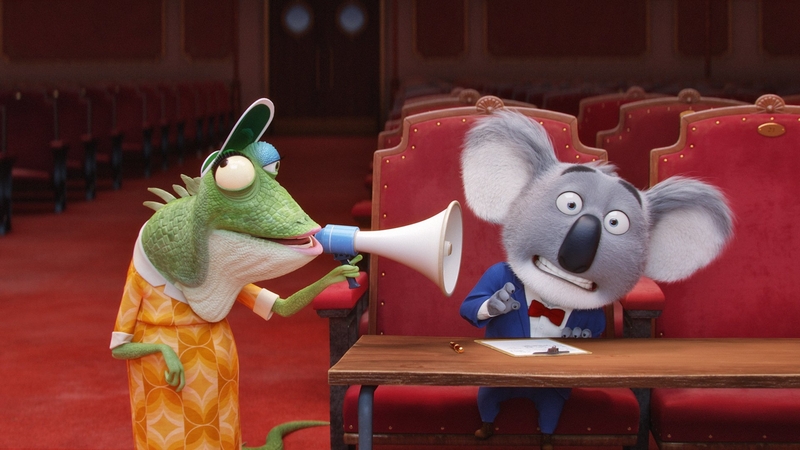 In Sing!, the Overall Story Issue is Ability. Each and every one of these characters experiences difficulties because of their perceived abilities as performers. The shared Overall Story Problem that motivates all of the conflict in the story is Effect: namely, everyone gears their attention on how their auditions or performances will turn out. This focus on effect causes them to completely overlook key factors–like maybe they should avoid building a giant aquarium for a stage. In order to achieve the Story Goal of living up to their own expectations and being something more than you are, the performers need to focus on the Overall Story Solution of Cause. That final performance is a benefit performance–a cause–and it showcases the positive results that occur when the characters “just start singing” and singing for themselves (make themselves happy), instead of worrying about the effects. Again, no surprises between story structure and storytelling. Their worrying about the outcome undermines them, while focusing on the cause saves the day. Straight forward and to the point. Much like the personal issues suffered by the Main Character, Johnny. Many see Sing! as Buster’s film. Others see it as Johnny’s film. While others see this as no one’s—and everyone’s–film. The latter find explanation as to their error in the above section on ensemble pieces. Those who inaccurately see Buster in the pivotal role should understand the difference between the Protagonist and Main Character as Buster provides the driving force behind the efforts to resolve the Overall Story’s Problem. Buster is the Protagonist. Johnny is the Main Character. With Buster and the other singers, the film presents their conflict from an objective point-of-view. We stand back and observe their struggle. Johnny is the only singer we see alone, a perspective that allows us to become intimately familiar with his personal issues. Johnny is a great singer trapped in the body of a giant gorilla. This Main Character Throughline of a Situation finds greater clarity of conflict in his Main Character Concern of How Things are Changing (or in this case, how things aren’t changing). As a Main Character with a Steadfast Resolve, Johnny’s Main Character Problem of Proven is treated more as a source of motivation, rather than an actual problem. Jonny literally wants to prove himself to his father. This drive draws attention again to the familiar aspect of this story’s structure. An Author expands and develops storytelling out of the storyform, out of the story’s structure. To simply rely on the structure itself as storytelling—I want to prove myself–a story risks revealing its raw intention and boring the Audience. If we were to tell you that living up to his father’s expectations broadcasts the key problem element in their Relationship Story Throughline, would you be surprised? Neither was anyone in the Audience. Continuing the trend of strict translation from structure to screen is the father/son relationship between Johnny and his father, Big Daddy (Peter Serafinowicz). Here, even the character’s name points directly to story structure. With a Relationship Story Throughline in Activities, the kind of conflict that erupts between father and son centers around doing things like robbing banks, and driving and practicing to drive the getaway car. In fact, Johnny even goes so far as to mutter to himself while practicing, “You’re not doing it right, Johnny! Speed up, Johnny! Do it like I showed you–” as he almost runs over his dad. To hit the Relationship Story Concern of Doing so squarely on the nose is akin to holding the Audience’s hand and guiding them like a child throughout the entire experience. “You and I are both alike” scene? Sing! covers that base as well with a classic back-and-forth exchange. Pile on the aforementioned Relationship Story Problem of Expectation and a Relationship Story Symptom and Response of being inadequate and passing as a criminal respectively and one quickly understands the source of comments like “unoriginal”. Sing!’s problem wasn’t that it was “unoriginal”, it’s that its storytelling didn’t stray from the structure of the story itself. Audiences instinctively know story structure–they use it everyday to solve problems and justify behavior. When an Author fails to graft an imaginative take onto those processes, the Audience feels like they have been cheated. They get the structure–they want creative storytelling on top of it to engage with and embrace. The only inkling of originality comes with Big Daddy’s fundamental shift in his point-of-view. When it comes to a great performance, musicians and artists everywhere know you have to bring it. You have to bring that excitement, you have to bring the passion to the Audience, and you have to make waves. Or you could bring a windstorm. As the Influence Character with a Changed Resolve, Big Daddy shares the same Problem Element as the Overall Story Throughline. In short, Big Daddy does not want his son “turning gay”–the Effect of hanging out with theater people pretty obvious to anyone who has lived a life of crime. With Effect situated as the Influence Character Throughline Problem in Sing!, the Influence Character Throughline Solution becomes Cause–just like the Overall Story Solution. But instead of simply supporting a cause, like the blatant story structure nod in the Overall Story Throughline, Big Daddy brings the thunder by forcing police helicopters to chase him all the way down to the final performance. By causing a windstorm that disrupts the entire scene, Big Daddy not only saves Mike and the rest of the show from the Russian bears, he also inspires Meena to later bring down the house with her own thunderous earthquake. Stories with a Story Goal of Being balance their narratives with a Story Consequence of Doing. If the characters fail to be, than they have to do. What happens when everyone finds out that Buster lied and they destroy his theater? He and Eddie have to do the most humiliating thing ever–wash cars with their puffy and spongy bodies. Stories that fail to do, end up having to be something they’re not. Sing! is a fun movie. The car-wash sequence is hilarious and some of the music sequences are downright toe-tapping fun. Unfortunately because the film failed to do more than simply ape story structure, it now must take on the role of an average and affable animated flick. Nothing wrong with washing cars–it’s an honest and reliable line of work. Great stories strive to be so much more than honest and reliable–they want to thrive and infect their audience with such great fervor that they live forever. Only then can they be something more than the sum total of their parts. Only then can they be truly great.